Freespire operating system, which available as a free download, is a community-driven and community-supported Linux distribution which is composed entirely of free and open source software, while also providing users the choice or option of including proprietary software including multimedia codecs, device drivers and application software. 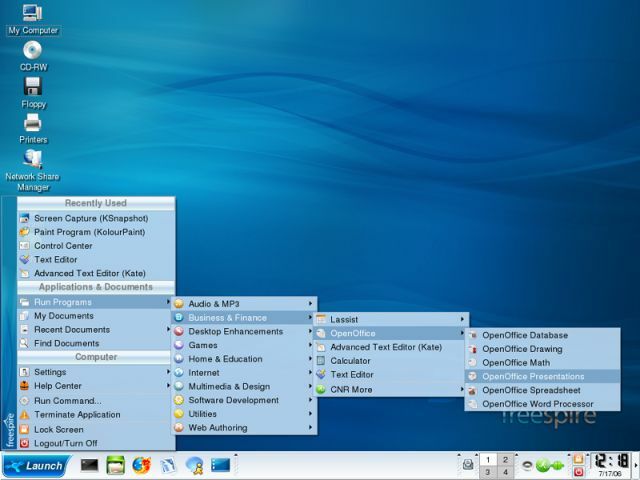 Freespire is tied to and originally derived from Linspire, a commercial operating system based on Debian GNU/Linux. As such, the proprietary elements in Freespire include the CNR Client, while other elements, which Linspire itself licenses but does not own, like the Windows Media Audio compatibility libraries, remain closed-source. Thus there is another edition of Freespire named Freespire OSS Edition, that includes only open-source components. Notable feature in Freespire is that the root account is not enabled by default, instead, only sudo rights are given to all members of the admin group. Beside, there is built-in out-of-the-box support for MP3, Windows Media, QuickTime, Java, Flash, Real, ATI drivers, nVidia drivers, proprietary WiFi drivers, modem drivers, fonts, and many more.